Was checking my the pictures in my phone and came across these pictures which were taken like two years ago? Glad I didn't delete them. Great pictures to go into my blog which may help my memory bank when the actual one starts having problems (like The Notebook by Nicholas Sparks). 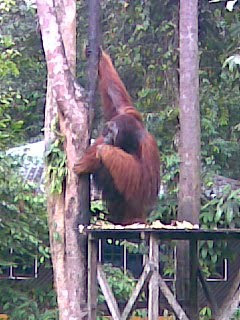 This big orang utan here is called Ritchie. Real huge. 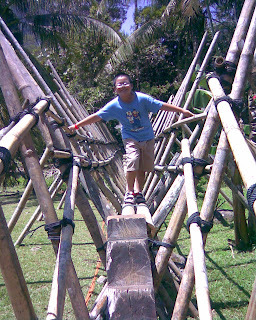 Can't remember what the guide told us about him...think the place is called Semanggol something something. Oh dear...the memory is gone. Anyway, I remember eating delicious seafood somewhere up in a building near the hotel we stayed...Holiday Inn ( I think). Love the soft shelled crab and the fish and the pucuk paku. Of course the boat rides across the river...was only a ringgit or less; so the kids and I would just simply get into the boat for a ride while waiting for KC to be done with his whatever work. The visit to the Sarawak Cultural Village was very educational and interesting. There was a cultural show and we climbed up many long houses. As usual; Dan had to do something that cost money or his name will not be Dan. He paid to blow the blow pipe at the Penan hut. The Penans are the poorest of all the different ethnic groups represented. A big place and quite a lot of walking to do. Good exercise and sight seeing for the kids. Waiting for another opportunity to visit Sarawak again. Maybe we should go to the actual long houses and stay with the natives. We did visit one long house....hmm; can't remember what's the name. Do you know that u r my inspiration??? Hahaha!! Much much to learn...quite frustrating...got stuck a few times. Need time to fiddle with this techno stuff.